1) An emphasis on intuition―the authors separate and explain the principles at work on a common sense, intuitive level before launching into any specifics. 2) A unified valuation approach―net present value (NPV) is treated as the basic concept underlying corporate finance. 3) A managerial focus―the authors emphasize the role of the financial manager as decision maker, and they stress the need for managerial input and judgment. 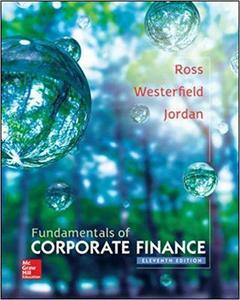 The Eleventh Edition continues the tradition of excellence that has earned Fundamentals of Corporate Finance its status as market leader. McGraw-Hill’s adaptive learning component, LearnSmart, provides assignable modules that help students master chapter core concepts and come to class more prepared. In addition, resources within Connect help students solve financial problems and apply what they’ve learned. Ross Fundamentals’ intuitive approach, managerial focus, and strong end-of-chapter content combine with a complete digital solution to help your students achieve higher outcomes in the course. If You Like This Blog Just Support hill0 & Purchase a Premium IcerBox Here Thanks & Enjoy!